While it was noted during an unofficial, informal tasting of Lay’s trial of cappuccino-flavored potato chips by Consumerist’s Boss Meg a few months ago that the snack “tastes how the mall looks,” others out there might actually have liked the dusting of sweet, coffee-ish powder on chips. 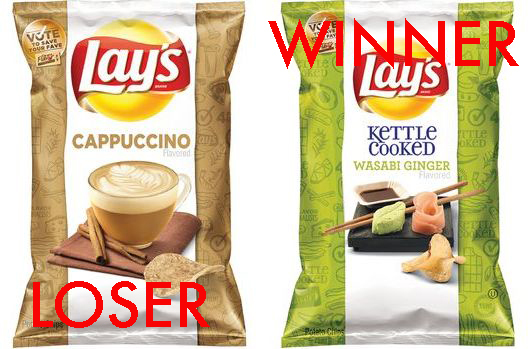 Those others, if you exist, are going to be quite bummed to learn that voters have instead chosen Wasabi Ginger as the newest Lay’s flavor. Yours truly managed to eat multiple chips out of curiosity, after buying a bag in the wild just for the heck of it, but let’s just say it was merely my sense of adventure that led me to subject my mouth to that mall taste for an extended period of time. And so it goes for oddly flavored snacks, as America has voted in Wasabi Ginger and said no to the coffee chip, Mango Salsa and Cheddar Bacon Mac & Cheese, reports the Associated Press. According to PepsiCo, Frito-Lay’s parent company, around 1 million total votes were cast on line during the “Do Us A Flavor” promo. This was the second year in a row for the contest, which collected votes from July through the last weekend on Facebook and Twitter. The lucky winner who came up with the flavor idea is a registered nurse from New Jersey, who will receive either $1 million or a year’s worth of sales, whichever amount is higher. As for how cappuccino-flavored chips ever came to be, Ram Krishnan, Frito-Lay’s chief marketing officer defended the idea to the AP. “The fact that it made it out of our selection process to make it to the final four is no small feat,” he said. The fact that more than one of those chips made it into my mouth and didn’t exit immediately is also no small feat, Ram.